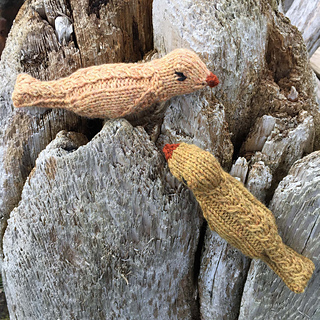 This little bird was designed to celebrate the The Net Loft’s 2018 Copper River Delta Birds by Hand Project. It is knit in the round using several gansey stitch patterns. A Gull Wing Cable runs the length of the back with ribbing under the tail and double seed stitch on the chest. Instructions for the tail and body are charted only, and instructions for the head are written. 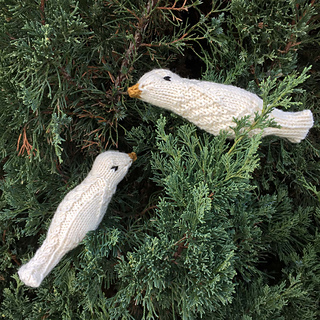 These birds knit up quickly in a variety of yarns at a firm gauge. Samples were knit with Cascade 220 wool and are approximately 7” (18 cm) long. Gauge: Use a firm gauge to conceal fiberfill.